Concentric Contraction (the ‘hard’ half of the rep) and Eccentric Contraction (the ‘easy’ half) yield different levels of hypertrophy, so knowing which is more effective is clearly to your advantage. Read on to find out which is more effective. You have probably seen people doing negative reps for example jumping up to the pull-up bar and doing the downward motion, that is an example of an eccentric contraction. Another eccentric example is having a friend help with the lifting of a bench press, then the trainee taking the full weight on the down movement. 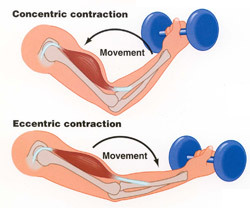 An example of a concentric movement is doing the lifting in a bicep curl, but then not controlling the down movement, letting it almost fall to the bottom. That is skipping the eccentric phase of the curl. To do both the concentric and eccentric phases requires you to control the whole movement, in and out, up and down, whatever it is. You control it up rather than throwing it up, and you control is down rather than letting it fall, then you have a full concentric and eccentric rep. So let’s get to the results. The results are from over 40 studies all on the quadriceps with training periods of between 14 days and 79 days. You can see that doing both the concentric phase and eccentric phase results in more hypertrophy that doing either or both of them separately. 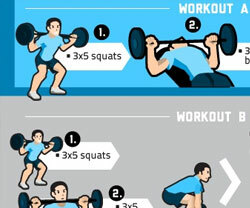 The complete reps are by far more effective than incomplete reps. Partial reps may have their place when you’re unable to complete full reps. For example if you can only complete 3 wide-grip pull-ups you may choose to complete 9 more negative reps afterward. 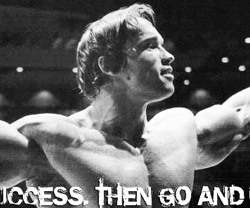 If you are capable of doing 3 pull-ups but instead chose to do 12 negatives, then you would be wasting your time. And for the people who drop the weight in the eccentric phase of the reps: start controlling the weight in the eccentric phase, and the study results show that your rate of hypertrophy could double. One Response to "Concentric versus Eccentric Contraction for Hypertrophy"